Super Bowl champion and literacy crusader Malcolm Mitchell presents the story of a magician who reveals an awe-inspiring treasure from his bag of tricks -- books that make every kid's dream come true! David, the Magician, loves to perform magic but his favorite trick is not pulling a rabbit out of a hat or finding quarters behind the ears of children. Instead, David knows the magical power of books, which can explore dreams and develop creativity. It's Family Fun Day at the library and a magician has arrived to entertain the families. 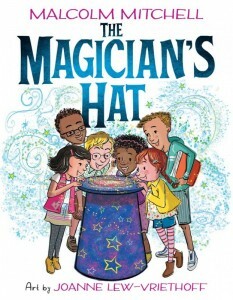 He has brought his magical hat with him and he invites the children to come up one at a time. "What do you want to be?" he asks them. After sharing their dream, each child reaches deep into the hat and pulls out a book...and that book somehow magically is perfect for them. But you know there is usually one in the crowd...the skeptic! This one boy doesn't believe in the magic of the hat or in the magic of reading. He challenges the magician, his hat, and story. He doesn't realize it but he is up against centuries of storytellers and dare I say, librarians, who have crafted that special ability to match a story to a child. Here is the book that explains it all..does our big reveal... because you know how amazing it is when you see into that "being" in front of you and you figure out his/her/their human puzzle, and you go get that book out of the magical hat and give it to its new rightful owner.